ROG Strix XG35VQ is a 35in WQHD curved monitor that wholly immerses you in the action. Its advanced features and design make it the perfect ally for any gaming adventure! With exclusive ASUS Aura Sync lighting technology, Strix XG35VQ provides ambient lighting that can be synchronised with other Aura-enabled components and peripherals. To achieve perfect synchronisation, simply connect ROG Strix XG35VQ to other peripherals by installing the Aura Sync software on your laptop or desktop. Enjoy the coolest and most stylish backdrop for any gaming setup, and have all lights pulsing to the beat of your favourite music or game sound effects. ROG Strix XG35VQ maximises your field of vision with a large 35-inch display and an 1800R curvature which ensures that every point is equidistant to your eyes. Thanks to its size and shape, you'll experience greater immersion and viewing comfort - even during marathon gaming sessions. Enjoy wide viewing angles with less distortion and colour shift, and get better visuals for games, movies, or anything else! Strix XG35VQ features a super narrow design, making it the ideal solution for almost-seamless multi-display setups. Build the ultimate battle station, and enjoy total immersion! The days of frustrating lag when playing fast-paced games are gone: With an incredible 100Hz refresh rate, ROG Strix XG35VQ gives you the upper hand in first-person-shooters, racers, real-time strategy, role-playing, and sports titles. 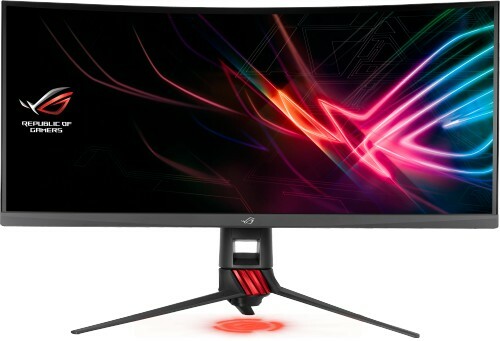 ROG Strix XG35VQ features the latest ASUS-exclusive Extreme Low Motion Blur technology, which achieves 1ms MPRT to eliminate smearing and motion blur, and makes objects in motion look sharper, so gameplay is more fluid and responsive. Adaptive-Sync (FreeSync) technology delivers the smoothest, fastest, and most breathtaking gaming visuals imaginable by eliminating screen tearing and choppy frame rates, and by minimising display stutter and input lag. ROG Strix XG35VQ gives you seamless, lag-free visuals when playing the latest games with fast-moving visuals. Light Signature is an exclusive feature that lets you create and customise light-projection effects on your ROG Strix XG35VQ. It includes two ROG logo covers and one blank cover for creating customised light projections that show your unique style. Stemming from the ROG commitment to creating the best gaming experiences, ROG Strix XG35VQ features the ASUS-exclusive GamePlus hotkey with in-game enhancements that help you get the most out of your game. This function is co-developed with input from pro gamers, allowing them to practice and improve their gaming skills. DisplayWidget is a utility software that lets users easily and quickly tweak settings or configure ASUS GameVisual, App Sync and blue light filters. Configurations can also be changed via the onscreen display or the navigation joystick, but ASUS DisplayWidget provides a faster and easier way to access these settings.